Saturday, July 11, 2009 marks a historic moment for the Arvada Center. 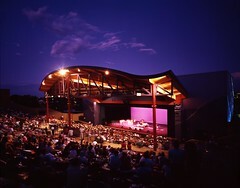 At exactly 7:30pm, for the first time in Arvada Center history, the Colorado Symphony will begin their schedule performance in the outdoor amphitheater, but what makes this performance unique from all the rest is that KVOD will be broadcasting it LIVE for all to hear. Colorado Symphony Orchestra’s Principal Guest Conductor Douglas Boyd leads the orchestra in this history making Mozart event. Become part of history and buy your tickets now to this historic concert. Any 5 concerts for $145 or any 3 concerts for $90 (covered only, no premium seats.) Packages are not available online, so please call the Box Office at 720-898-7200. Reserved lawn seating section with beach chair provided. The Arvada Center will no longer be renting beach chairs. Please check out Related Link on this page to find out about appropriate chairs you can bring in as well as other ticketing and entry policies for our concerts.